Plus, Xi’s anti-corruption campaign, trouble for foreign NGOs, and Xi’s visit to Korea. Friday China links. 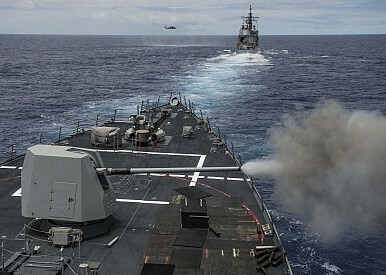 As Zach noted on his blog today, Chinese media is a bit torn on China’s participation in this year’s RIMPAC exercises. On the one hand, it’s a positive sign for U.S.-China cooperation, and a prestige boost for the Chinese navy as well. On the other hand, China has so long denounced RIMPAC as an outdated relic of the Cold War that it’s a bit difficult for media outlets to entirely embrace the exercise. Meanwhile, the New York Times’ Sinosphere blog explores the signs that China is cracking down on foreign (and particularly American) NGOs. Given Xi’s emphasis on ideological purity, and the necessity of avoiding the infiltration of Western values, this step is not a surprise. NYT reports that even Chinese NGOs are being asked to fill out detailed forms on how much interaction they have with foreign organizations, particularly in terms of funding. So far, there has been no movement to change China’s policies on NGOs, but this could be the first step in an official crackdown. As further evidence of China’s growing paranoia about Western cultural imperialism, Tea Leaf Nation looks at a Global Times article that blames Hollywood films (namely, The Dark Knight Rises and Cloud Atlas) for the current pro-democracy movement in Hong Kong. Finally, Xinhua reports that the date has been set for Xi Jinping’s trip to South Korea: July 3 and 4. A Foreign Ministry spokesman said that, during the visit, Xi and President Park Geun-hye “will further outline and promote bilateral cooperation.” For a preview of the visit, see Robert Kelly’s feature piece in The Diplomat. Retaliation against South Korea won't help. To stop THAAD, China must rethink its North Korea policy.